Ambience is a collection of plug and play modules for VBS3 that add a background pattern of life in VBS3. It provides plugins to add both traffic patterns and civilian behavior, or either one of them to match your training requirements. 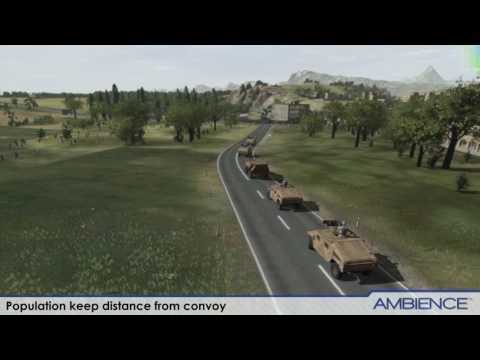 Once installed, Ambience can populate your virtual cities with hundreds or even thousands of civilians and vehicles. Traffic Ambience and Crowd Ambience are bundled into Ambience. Ambience is fully integrated with VBS3 and can support many more simulated people than VBS3 can support on its own. This balance of high entity counts and tight integration makes Ambience truly unique. 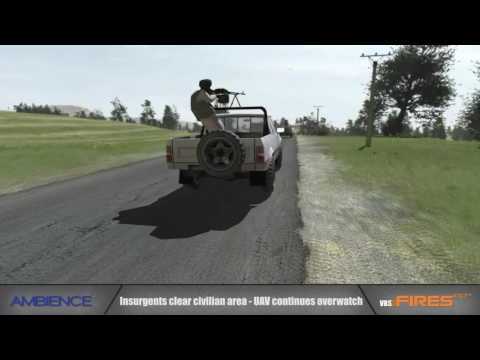 Vehicles generated by Ambience can be damaged and will avoid externally or player controlled vehicles of humans on the roads. Traffic lights, uncontrolled intersections, multi-lane roads and vehicle overtaking are all supported. Using Ambience objects you can easily add a background pattern of life to the VBS3 environment, no programming or scripting is required. Configuring entities’ behavior is straight forward. For example, using a simple slider bar, you can change the behavior from a chaotic pattern of life matching a developing country, to an ordered pattern of life matching a developed country, or indeed anywhere in between. Ambience supports an API for VBS3 scripting. It allows advanced customization of the behavior of vehicles populated by Ambience. It can be combined with VBS3 triggers, to ensure the background pattern of life can be modified to support the training requirements. Ambience is purchased as a Server License. One license can support multiple clients connecting to a scenario where the seat hosting the scenario will consume the license. One license can accommodate one network or standalone scenario. A licence of Ambience for VBS3 and one year of support is required for the VBS3 server and for every instance of VBS3 participating in a VBS3 scenario. For example, to create a pattern-of-life in a scenario with a dedicated server and three players, you would require one licence of Ambience support. 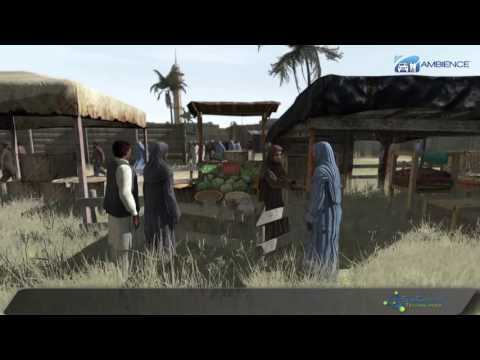 This one Ambience license will be used for the dedicated server as it is the computer which Hosts the mission.